This year our boys are playing Upwards basketball at a local church. We love it. They love it. The best part is that for the first time ever in any sport, our boys have practice on the same night at the same time at the same place. It's been wonderful. Tom has been taking them each week and I get to stay home and catch up on things during a wonderful 90 minutes to myself. Last night the phone rang at about the time practice should have been over. It was Tom calling to tell me that "something happened" in practice and he thought "something was wrong with Blake." Then I could hear Blake screaming in the background. I knew he was hurt worse than he'd ever been before. I told Tom to head to the urgent care center and I'd meet them there. Aside from worrying about Blake, on the drive up I went into panic mode thinking we'd all walk out of there with flu, too. I was surprised to pull into an almost empty parking lot. Luckily, Blake hadn't had to wait (or sit in a flu infected waiting room!) and was taken right back to an exam room. The nurse commented that we had just missed "the rush." At least Blake had good timing! Right after I entered the exam room, they took Blake back for x-rays. He wanted me to go with him. He was in so much pain it was painful for me to watch. I felt helpless because I couldn't fix it for him. His wrist is broken. The radius is split all the way across. In his right arm. Yes, he's right-handed. Basketball season is over just two games into the season. He was devastated. They put a split on his arm (which caused more pain and screams) and sent us home. Today we had an appointment with an orthopedic specialist. He confirmed the break. 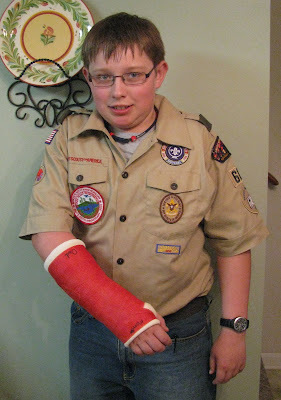 Blake received a new cast in his color choice of red. Today's events weren't quite as painful. I was happy to see that the real cast will allow for movement of his fingers. Plus, the cast doesn't cover his elbow like the splint did so it will be so much easier for him to dress and perform other routine tasks we take for granted. (This morning I felt like I had my "baby" back while we were trying to get ready.) When we got home, Kevin was the first to sign the cast. And then my boy put on his Boy Scout uniform and headed out for a meeting. He'll be back to school tomorrow. We follow up with the doctor in a couple of weeks for new x-rays and to evaluate how it is healing. If all goes well, he'll only have the cast for about 5-6 weeks. We are keeping our fingers crossed. Baseball starts in 6 or 7 weeks! Oh bummer! Hopefully he'll be better for baseball! Knock on wood...we haven't had any broken bones yet! What an ordeal! You are so lucky to get through the urgent care that fast and without bad weather! Hope Blake is feeling ok and that his arm heals quickly. Lots of milk! I do hope he will heal up soon. I see you made it to the Nook finalist list...well done Amy. Oh Amy....I hope Blake's arm heals quickly (esp. with how much he loves sports). Look on the bright side...At least it is winter time and not summer and having to stay out of the water for that long in the heat or miss baseball season. Oh no!!! OUCH! poor guy, I sure hope he heals fast! Oh sad face here! Poor Blake! I will pray for fast healing so he is all better for baseball season. Poor kid! I hope he is getting used to the cast and enjoying the attention at school. We know how you feel. Cameron broke his in August right before his second soccer practice (and that is his favorite sport). I hope it heals up quickly! !